Sony's upcoming 2018 smartphone lineup has been leaking left and right recently. 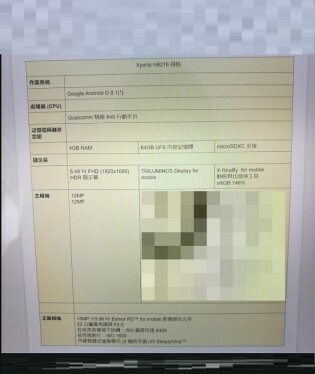 Last week, a potential XZ Premium successor was identified, carrying the H8116 and H8166 model numbers, following a pair of other leaks. A few other 1080p flagships were mentioned in the source as well, with the following model numbers: H8216, H8266, H8276 and H8296. We originally speculated these were variants of a Xperia XZ1 successor, potentially titled the Xperia XZ1S or Xperia XZ2. A theory further backed by a fresh new specs leak for the H8216. It claims the handset will measure 148 × 73.4 × 7.4 mm, weigh in at 156 grams and feature an IP65/68 rating. It will run on the new flagship Qualcomm Snapdragon 845 chipset, along with 4GB of RAM and 64GB of storage. Up front, as previously confirmed, will be a 1,920 x 1,080 pixel display, with a diagonal of 5.48 inches - a bit bigger than the 5.2 inches of the XZ1. Considering the dimensions of both devices match up, this should entail much thinner bezels. Then again, we are not exactly sure there are enough bezels to shave off the XZ1 to begin with, to net a 0.3-inch display growth. So maybe the leaks is misleading in this respect. In the camera department, fans can expect two 12MP snappers on the back and a 15MP one on the front. The device will ship with Android 8.1 Oreo and a 3,130 mAh battery, with Quick Charge support will be keeping the lights on. To add a couple of final details, to what is already a pretty complete picture- the document also mentions Dual SIM support and oddly enough, a microUSB port. I'm in with Sony beaSt cells. 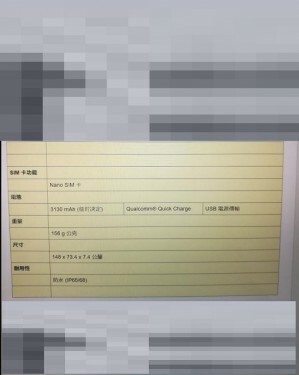 I hope this leaks are misleading don't want sony to end up with that much pixels of camera also the ram and battery. I don't want something that is already available in 2017, dissapointing.